Welcome to the NIIF/HUNGARNET IPv6 project! NetworkShop 2008 conference: IPv6 and eduroam tutorials by János Mohácsi (NIIF) and András Jákó (BME). Linux firewall tutorial by József Kadlecsik (MTA KFKI RMKI) with focus on IPv6 firewalling. nfsen, nfdump and ndpmon FreeBSD packages were updated. BME: investigation of IPv6 hacking tools. To read test report, click here. SZTE: NetSpotter Ethernet support. See NetSpotter Sourceforge page. BME: IPv6 students' lab implemented. MTA KFKI RMKI: IPv6 based SMTP services introduced. MTA KFKI RMKI: implementation of a GFS filesystem based cluster, which IPv6 enabled some internal services (POP/IMAP, SMTP, HTTP/HTTPS). Migration made http://www.kfki.hu and 21 other virtual webserver reachable over IPv6. SZTE: NetSpotter testing and development (refactoring, PIM-SM discovery, MLD discovery, Topology Discovery and Network Testing modules). See NetSpotter Sourceforge page. ns.sztaki.hbone.hu central DNS server migrated to v4/v6 dual stack. MTA KFKI RMKI: L2D2 development based on operational experiences. Investigation of IPv6 capabilities of grid resource managers (SGE, Condor, GUG Cluster Manager), supporting libraries and applications (PVM, MPI and NFS, DHCP) and gird middleware frameworks (ARC, gLite, GUG). Click here to read about tests (only in Hungarian). DSL configuration on Cisco routers (only in Hungarian) document uploaded. nfsen and nfsump FreeBSD packages were updated. NetFlow v9 integration into HBONE management system is finished. Production environment implementation of "Development and testing IPv6 firewalls and IPv6 security services" (for Hungarian version, please click here) in partners' network. DSL CPE testing: co-authoring in IETF v6ops draft on CPE capabilities. NIIF: introducation of IPv6 based office services (web, SSH, NTP, SMTP, IMAPS). 2nd Campus IPv6 workshop organised by NIIF and Council of Hungarian Internet Providers (ISZT): See workshop webpage and video archive of the workshop. NIIF's DNS and NTP services are reachable on IPv6 now. Technical university of Budapest: eduroam is deployed. MTA KFKI RMKI: L2D2 tool is introduced in IPv6 LAN network management. University of Szeged: Improved topology discovery module for NetSpotter. NetworkShop 2007 conference: an IPv6 tutorial was held and achievements of Campus6 project were presented. IPv4 preference in an IPv6 environment tests on Linux. Windows Vista and Windows 2003 Server IPv6 experiments. Technical university of Budapest: IPv6 capable firewall deployed. MTA KFKI RMKI: eduroam deployed and used in production. ICMPv6 filtering draft RFC4890 is published. NetSpotter tests in production environment. GUG middleware is IPv6 capable now. MTA KFKI RMKI: Postfilter IPv6 support added. Integration of NetFlowv9 into production flow monitoring facilities started. MTA KFKI RMKI: secondary DNS server of kfki.hu is reachable over IPv6, time.kfki.hu also became IPv6-enabled. University of Szeged: Deployment of NetSpotter agents accross the country. Siemens: presentation on "Implementation of IPv6 service in DSL environment" at the Magyar Telekom PKI Conference. Siemens tested Cisco 871 as a DSL CPE router. University of Szeged updated NetSpotter network monitoring application. A telnet/SSH access module and TTCN language related features were added. Improvements to be presented on a future conference. MTA KFKI has reconstructed its computer network. The network backbone and many KFKI services became IPv6 enabled. Budapest Internet Exchange: Thanks to further cooperation with the Council of Hungarian Internet Providers, IPv6 peering through the Budapest Internet Exchange is possible. DNS: NIIF/HUNGARNET DNS service is reachable through IPv6. According to successful cooperation with Council of Hungarian Internet Providers (aka. ISZT in Hungarian), primary server of hu ccTLD gained IPv6 connectivity. NIIF service cluster load balancer was IPv6-enabled. eduroam: HIK and University of Debrecen connected to eduroam. Full list of Hungarian eduroam partners is available here. For more information, please see http://www.niif.hu/hu/eduroam webpage. IPv6 FAQ was updated, configuration howtos and examples of major server applications (e.g. SMTP, HTTP, FTP, DNS, SSH, etc.) are available in English. spv6 mailing list was created in order to exchange IPv6 related information among Hungarian service providers. IPv6 ADSL test: NIIF is waiting for the Hungarian Telecom to upgrade software of its Cisco E10000 devices. IPv6 firewalls and IPv6 security issues: http://6net.niif.hu/m/IPv6firewallsandSecurity. Short description of IPv6 firewalls (BSD pf, FreeBSD ip6fw, Linux netfilter/ip6tables, SecureFilter and Cisco ACL), configuration examples and an overview of IPv6 security issues together with useful URLs are also available. Campus IPv6 network management solutions: overview of network management applications and description of L2D2 management tool. Flow based network monitoring: flow based monitoring introduction, SCTP protocol tutorial (in Hungarian), SCTP socket programming, NetFlow and related SCTP configuration of Cisco routers, overview of NetFlow tools and a basic nfsen IPv6 tutorial, description of SCTP enabled samplicator and its implementation are all available in this section. IPv6 multicast a important monitoring applications: IPv6 multicast components and their configuration (BSD and pim6sd, XORP, Linux + pim6sd, MRD6 and Cisco configuration) and documentation of NetSpotter multicast monitoring framework. Remote access to campus resources: IPv6 dial up services, IPv6 over DSL, configuration examples and related tests. Campus IPv6 workshop: Campus IPv6 workshop webpage and video archive of 1st workshop. SZTE: article on IPv6 multicast testing is submitted to IPv6 Today - Technology and Deployment IPv6 workshop in Bucharest, Romania, August 1-2, 2006. BME: participation in BSD pf testing. SZTE: a J2EE and web based network monitoring and testing tool focusing on multicast issues released and available at https://sourceforge.net/projects/netspotter. 6BONE network finally stops functioning after years of supporting IPv6 transmission over existing IPv4 networks. IPv6 DSL testing started. Cisco has fixed the E10000 bug (bugID CSCsd13298). nfsen beta testing started. General tests and IPv6 multicast traffix export tests. Testing of BDS pf has started. Tutorial and examples for BSD pf. ICMPv6 filtering IETF draft updated version is available here. IPv6 tutorial "How to introduce IPv6 in our network" and a lecture about the Campus6 project at the Networkshop 2006 conference. SZTE: development of multicast test traffic generator and network measurement application started focusing at IPv6 multicast. Janos Mohacsi's lectures at 6DISS-SEEREN joint IPv6 workshop in Kopaonik, Serbia & Montenegro. L2D2 tool page in Campus6 wiki. University of Szeged Campus6 page started. Campus6: Campus6 project contract signed. Official project start. SNMP over IPv6 testing on Cisco routers. IPv6 peering with service provider Pantel. IPv6 peering with Euroweb service provider. IPv6 DSL tests. Cisco 10000 Series (ESR) PPP IPv6 payload length bug found, reported to Cisco. Janos Mohacsi's lectures at 6DISS workshop in Port Elisabeth, South Africa. Cisco 3750 beta software testing. Campus6: IPv6 campus survey is evaluated. See results here. János Mohácsi co-authored a draft about Best Current practices for ICMPv6 filtering for IETF-63 meeting. Introduction of Campus6 project at HBONE technical meeting by János Mohácsi and András Kovács. Download presentation from here. IPv6 Security: Threats and solutions - presentation, given by János Mohácsi at GARR 2005 conference/3rd 6NET workshop, Pisa, Italy. Contribution to D2.3.4v2 with performance measurements on Cisco 7200 platforms by András Kovács. Started to test SNMP over IPv6 on Cisco 7200 platform. Migration of the 6NET backbone to the new GEANT Multicast Service. Started to test Cisco IOS 12.3(14)T on Cisco 7200 platform. Reintroduce IPv6 Multicast service in backbone of NIIF/HUNGARNET with Cisco 7206 VXRs coprocessors to overcome limitations of Cisco 6500 devices. "IPv6 deployment and network management from practical point of view" tutorial at the NetworkShop 2005 conference by Janos Mohacsi. 29th of March - 1st of April, 2005: NetworkShop 2005 14th yearly HUNGARNET conference streamed over IPv6. Archive is available over both IPv6 and IPv4. Janos Mohacsi presented some topics at IPv6 network management tutorial held at AMREJ, Beograd, Serbia & Montenegro: IPv6 Security: threats and solutions, IPv6 interdomain routing:BGP, IPv6 BGP hands on laboratory. The progress of NIIF IPv6 project presented on the monthly meetings of the HBONE managers. 28th of January, 2005: Avram Hershko, the Nobel Laureate (2004, Chemistry) Hungarian-Israeli scientist was the special guest of Hungarian Academy of Sciences in Budapest. The lecture of Mr. Hershko is available in our archive: IPv6 / IPv4. 27th of January, 2005: IPSZILON seminar Internet broadcast. The topic was: RAID and ENBD: effective maintenance of disk arrays using Linux. The archive video is available via both IPv6 and IPv4. We started to test IPv6 in DSL environment. Reverse IPv6 DNS configured for Széchenyi István University at Győr. Cisco Catalyst 3750 with beta IOS image started. 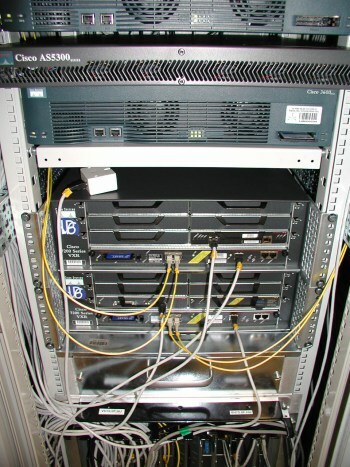 Cisco 7200 installed in Széchenyi István University at Győr to provide IPv6 service in their internal network. Cisco 7206 IPv6 router was removed from University of Veszprém in favour of Cisco 6506 with a sup720 card. L2 VPN STM-1 connectivity to 6NET was shutdown. Stateless DHCPv6 implementation tested under Cisco IOS and FreeBSD operating system. Some toplevel Hungarian domain servers in the network of NIIF/HUNGARNET are queriable via IPv6, but unfortunately the .hu root server are still IPv4 only. Széchenyi Istvén University at Győr connected to IPv6 network of NIIF/HUNGARNET. College of Finance and Accountancy of Budapest Business School started to provide IPv6 service on their internal network. 6NET organized IPv6 network management tutorial by János Mohácsi (NIIF/HUNGARNET), Gunter Van de Velde (Cisco Systems) and Jerome Durand (RENATER). Tutorial topics: routing aspects of IPv6, Cisco and Juniper routers, IPv6 network management, IPv6 firewalls, etc. The tutorial event was broadcasted by NIIF/HUNGARNET over both IPv4 and IPv6. Video on demand archive of the tutorial can be found at the NIIF/HUNGARNET VoD portal. For IPv4 access click here, for IPv6 access use this link. Testing results of IPv6 p2p protocols presented on tf-ngn meeting in Lisbon. The 1st 6NET organised IPv6 network management tutorial at CINES, Montpellier,France delivered by Jerome Durand and János Mohácsi, with considerable success. Interface duplexity problem corrected on the management interface of the router in Miskolc. Cisco c6500 with IOS 12.2(18)SXD1 is crashing on command show bgp ipv6 unicast prefix. Case opened and the problem is under investigation at Cisco. IPv6 - step forward in the security? Presentation of Szabolcs Szigeti and János Mohácsi presented by János Mohácsi on Hisec 2004(High Security 2004 -Information security conference in Hungary) conference. IPv6 Video streaming: 9th Software Technology Forum: New challenges for computing research and development. The archive is available over IPv6 also at: http://vod.niif.hu/stf9/ . The routing policy updated to reflect the new allocation made by RIRs. IPv6 monitoring capabilities of RIPE TTM boxes presented on the monthly meetings of the HBONE managers. RIPE TTM IPv6 monitoring problems has corrected. We found an error that prevents MPLS label propagation to Cisco 6500+SUP720 with 12.2(17b)SXA. Some clean up in IPv6 routing in the HBONE Core. The Hungarian Electronic Library (MEK) is reachable via IPv6 also at http://mek2.niif.hu or IPv6 only at http://mekipv6.niif.hu. The MEK library one of th most prominent project of NIIF since 1995. The MEK Electronic Library and collection contains more than 5000 quality publications in Hungarian. The Cisco 6509 with SUP720 at Miskolc and at Szeged configured to carry IPv6 traffic, thus University of Miskolc can run IPv6 at gigabit speed. János Mohácsi presented "Juniper router integration into a Hungarian operational network - results and observation from IPv6 projects" - on Siemens Szimpozium 25th May 2004. We started to migrate the HBONE core to true IPv6-IPv4 dual-stack operation. The GSR6 migrated to dual stack: the GEANT IPv6 connectivity become native. We continues the migration of HBONE core to true IPv6-IPv4 dual-stack operation. The GSR16 migrated to dual stack: the GEANT IPv6 connectivity become fault tolerant. Started to test IPv6 on Cisco 12406 with IOS 12.0(27)S.
Sup720 cards are installed at University of Szeged and Miskolc University to support high performance IPv6. However IPv6 connectivity still provided by separate Cisco 7200. Reverse DNS servers of KFKI Research Institute For Particle and Nuclear Physics of The Hungarian Academy of Science registered. "The Fine Arts in Hungary" website is now reachable via IPv6 also. This site is dedicated to fine arts in Hungary from the beginnings in the Romanesque period up to the mid 20th century. The exhibition, opened in 1997, created by Emil Kren, and continuously developed since its opening. The upgraded collection was published in February 2004 both in Hungarian and in English, and now made reachable via IPv6 NIIF/HUNGARNET and KFKI-RMKI. The upgraded collection contains 5100 reproduction (the original 11000). Native IPv6 peering established to GEANT on the backup link. L2 VPN connectivity that will be used for 6NET connectivity has established. IPv6 router at Miskolc become unreachable via IPv4 SNMP, since the network processor card of the main Cisco 7200 get faulty. This did not affect the IPv6 forwarding, but only the monitoring, since MPLS (P router) provided by Cisco 6500. The faulty card has replaced. Report about NIIF IPv6 project in the NIIF newsletter. Continued testing Cisco 6500 in IPv6: Bug found in 12.2(17a)SX1, that made crash the router when ISIS routing enabled on loopback interface. The bug has identified and corrected. The routers has been upgraded to 12.2(17b)SXA. Team at University of Szeged started work on enabling IPv6 multicast support for Linux Kernel to run KAME pim6sd daemon written for *BSD. IPv6 deployment at NIIF/HUNGARNET reported to DANTE to prepare GEANT newsletter. 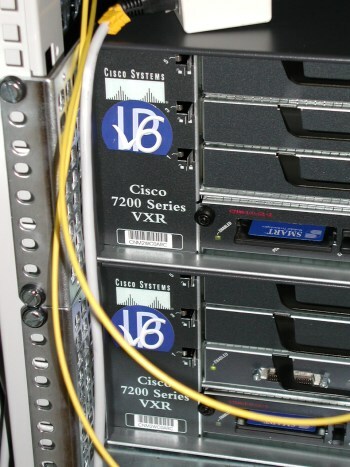 Performance test of Cisco 7206VXR ended and will be reported soon. Private IPv6 peering was set up with Synergon Ltd.
New EFT image tested and bug found. Test the performance of Cisco 7206VXR in different scenarios. IPv6 only Video on Demand test service started with conjunction of WP5 of 6NET. FTP servers and NTP servers at KFKI are IPv6 capable. New IOS EFT images (Multicasting and NetFlow v9 ) tested on the test routers but due to bugs we did not deploy. "NIIF/HUNGARNET IPv6 project" - discussed at Siemens Hungary Rt. Discussion about the IPv6 deployment at NIIF/HUNGARNET. Decision about the IPv6 deployments of further sites and Hungarian IPv6 tutorials later this year. New IOS software release (IOS 12.2(15.6)T) tested on the network. Private IPv6 peering was set up with Antenna Hungaria Hungarian Broadcasting and Radio Communications Corporation. Videolan client tested and demonstrated on Networkshop 2003. The The W3C conference 2003 website made reachable via IPv6. Basic monitoring tools has installed and deployed. The central monitoring server installed. Web pages are rehomed. 1st of September: HUNGARNET is official member of the 6NET project.